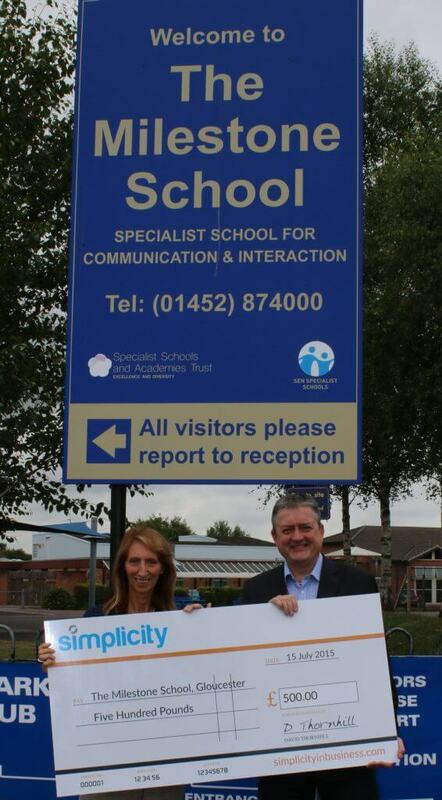 Simplicity make the ‘first of many to come’ donations to The Milestone School, Gloucester. Simplicity has started a new fundraising scheme involving their customer’s with satisfaction surveys. For every survey completed they will be making donations to chosen charities in their local area. They had a good response from their first survey and generated enough feedback to make a very helpful donation of £500.00 to one of their chosen charities; The Milestone School. The Milestone School is a special school based in Gloucester, for children aged from 2 – 16. They are one of the largest special schools in the country and accommodate over 300 pupils, in 33 classes and four key stages. The majority of pupils have Severe Learning Difficulties (SLD), there are also many with Profound & Multiple Learning Difficulties (PMLD) and Severe Autistic Spectrum Condition (ASC). Not only do they provide pupils with their exceptional expertise and resources, they also provide the children’s families with an outreach service which provides them with all the support and advice needed. Milestone School have great aspirations to offer the very best educational opportunities for all of their pupils. Therefore they are dependent on the support and generosity of individuals, companies and grant schemes in order to fund a range of vital activities which help enrich the children’s educational experiences. With the help of their customers, Simplicity has been able to help fund the Schools ICT Project, enabling them to purchase a new iPad for pupils to benefit from in the future. The iPad will provide powerful new tools to enhance communication for individuals with neurogenic disorders and degenerative neurological conditions. Simplicity believes that raising money for charities is vital, creating awareness to inspire other businesses within the Gloucestershire community and recruitment industry to help them with the funding they need. You will be pleased to know that Simplicity will be running another Customer Satisfaction Survey very soon and they aim to increase the amount of customer feedback responses, in order to make more and even larger donations. This is the first of many charitable donations to come!